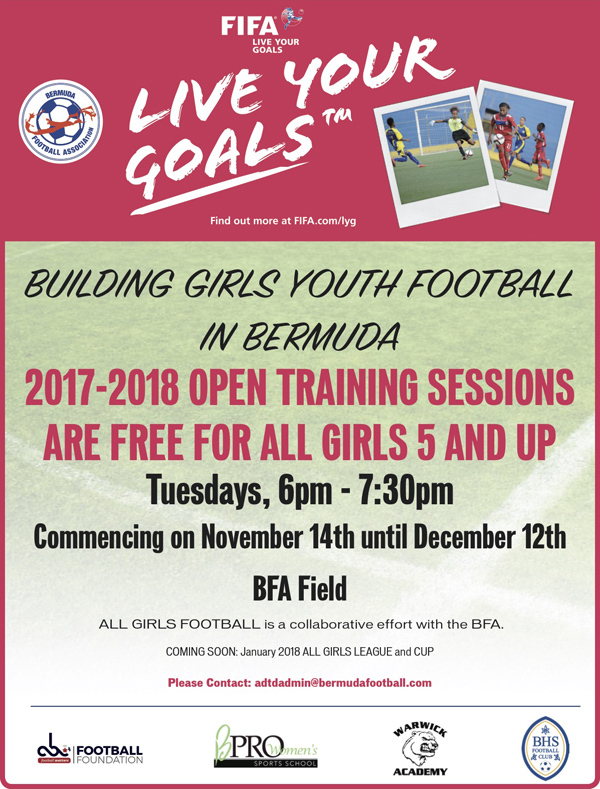 The Bermuda Football Association [BFA] is holding training sessions for girls aged 5 and up, running from today [Nov 14] until December 12. A spokesperson said, “The Bermuda Football Association has always worked to create a supportive, developmental football program for young girls in Bermuda. This goal reinforces the commitment by the BFA to provide a league for young players to grow and/or enhance their skills. “Following attempts to develop a sustained women’s league in 2012, a girls’ football-working group was formed in September 2017 to reinvigorate the concept of a girl’s league. Along with support from the BFA, other members of the girls’ football working group include, BHS Football Club [BHSFC], Warwick Academy Football Club [WAFC], ABC Football School [ABC] and B-Pro. “The football-working group has outlined objectives including organize and facilitate a Girls Football League in January 2018; organize and facilitate Girls Technical Training Night for all girls who desire to enhance their football development regardless of ability; organize and facilitate Girls Opening Tournament on January 6th 2018; assist with promoting girls football island-wide to increase participation; collaborate with the BFA to develop strategies to increase the technical and tactical proficiency of all girls and teams; and assist with developing a sustainable plan and implementation for girls’ football in schools. “Open training sessions will begin on Tuesday, November 14th and every Tuesday thereafter through December 12th from 6:00 p.m. – 7:30 p.m. This is the opportunity for all girls ages 5 and up who are interested in playing football to participate and learn from qualified coaches, develop theirs skills and build a foundation in teamwork. Its the simple little things that make me happy. Just the fact it says “Football” and not “soccer” is fantastic.